Tootoot are now offering schools a free trial of their award-winning pupil voice and anti-bullying app! Tootoot’s founder Michael Brennan explains how tootoot can support your school, and why you should sign-up for the free trial today. In recent years there has been a rise in the wellbeing and mental health issues raised by children and young people, in part this is due to the unique pressures young people face with things such as social media and exam stress. It has been recognised that children identify and report more concerns, such as mental health and homophobic bullying, than are reported by their teachers; showing a clear need for tools that make it easier for pupils to speak-up about their concerns. Research released in Autumn 2018 found that pupils are more likely to seek support for mental health online, using digital tools such as phone apps to speak up about their concerns. I want all young people to have the key to unlock the support they need to reach their full potential which is why I founded tootoot, the app that makes it easier for pupils to speak-up confidentially, and ensure that all pupil concerns are raised, listened to and resolved. I used my experiences of bullying to create a pupil voice app that is trusted by over 15,000 teachers to enhance wellbeing and safeguarding for their pupils, making it easier for pupils to speak-up and feel that their concerns are listened to and properly resolved. 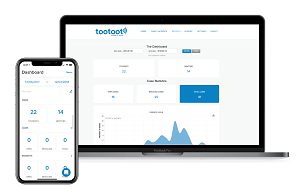 Tootoot also supports schools with their Ofsted inspections, making it quicker and easier for teachers to gather data about bullying and safeguarding incidents as well as demonstrating how effectively the staff and pupils deal with instances of bullying behaviour. “Tootoot has been an amazing addition to our school. It has helped us learn about a number of pupil concerns earlier than we would have learned about them with traditional methods such as face-to-face reporting. It has also given our SLT the data needed to make informed decisions about how best to support our pupils. Tootoot are now offering schools a free four-week trial of this award-winning pupil voice and anti-bullying platform. Sign your school up here tootoot.co.uk/sign-up. Sign-up to Tootoot’s Pupil Voice Week 2018. After a record-breaking year last year, with over 150,000 pupils joining, tootoot’s Pupil Voice Week is back and bigger than ever. Running from the 24th – 28th September, this year’s Pupil Voice Week has more partners and resources than ever before to help schools celebrate. With the theme ‘Use Your Voice’ Pupil Voice Week this year will celebrate all of the incredible things that happen when our children and young people use their voice to speak-up about the things that are important to them. Children and young people are our future and hold a huge potential for the communities they are part of. We know that when children feel valued and confident to speak-up it creates a positive force for change. We want children around the world to feel comfortable to speak-up about anything; empowering children’s voices should be at the core of everything we aim to do which is why the Pupil Voice Week activities, lesson plans and resources focus on the idea that it’s good to speak-up, and that if we want to make a positive change in our communities children’s voices have to be a part of that. It is time to act now and work together to make sure that this becomes a reality. Sign-up and download the resources and activities. Let’s celebrate the pupil voice together. Receive your free support and resources by signing up at pupilvoiceweek.co.uk, and join the celebration on social media from the 24th – 28th September using #PupilVoiceWeek and tag @tootootofficial. Pupil Voice Week 2017 will be celebrated by schools both nationally and internationally with the theme ‘It’s Your Voice’. What is Pupil Voice Week? Coordinated by tootoot, Pupil Voice Week is designed to encourage primary and secondary schools to raise awareness of key issues, such as bullying, cyberbullying, racism, mental health and e-safety issues, that children and young people may face on a daily basis. This year the theme is ‘It’s Your Voice’. We aim to celebrate the diversity and individuality of The Pupil Voice, encouraging pupils to use their voice be themselves and create positivity for those around them. Pupil Voice Week will also have a focus on pupils' mental health, ensuring that they are encouraged to use their voice to speak-up about their mental health and wellbeing. Pupil Voice Week calls upon pupils, parents, carers, teachers, social workers, councils, companies and policy makers, to join together and explore ways that they can empower pupils, giving them the knowledge and tools they need to feel confident to use their voice. Within the past year 1.5 million children and young people have been bullied. Children and young people can be bullied for all manner of reasons from appearance and accents to gender and race. And although not their fault, it can still have a huge impact on their self-confidence, mental health and wellbeing. This is why we want to celebrate the pupil voice, the fact that’s it’s good to be different, and that a pupil’s voice is the most important part of them. When is Pupil Voice Week? Pupil Voice Week is the 25th – 29th September 2017 with activities running throughout the week in schools, organisations and online. Celebrating Your Voice – Our Call to Action! We want Pupil Voice Week 2017 to empower pupils, helping them to understand that their differences are to be celebrated. How else can we get involved? Use the resources on pupilvoiceweek.co.uk to help inspire and shape your own campaign. Speak to your schools and partner organisations, let them know about Pupil Voice Week and the ways that they can get involved. Write a blog raising awareness of the importance for pupils to know it’s their voice and it’s good to be unique! – make sure you send it to us so we can share it too! Send a newsletter to your key audience groups, encouraging them to participate in Pupil Voice Week. Contact local press and key decision makers, speak to them about the importance of raising awareness with pupils nationally, and ask them to help promote the week. Join the conversation on social media during the lead-up to, and throughout the week, using the hashtag #PupilVoiceWeek and tag @tootootofficial. Send us pictures or videos of what you get up to, to pupilvoiceweek@tootoot.co.uk, and we’ll feature them across our social media – you might even make it into next year’s video! We have a range of free resources to help you kick-start your campaign, you can find them at pupilvoiceweek.co.uk. As well as those, feel free to use any of the facts and figures below to help shape your Pupil Voice Week campaign, both on and offline. Within the past year 1.5 million children and young people have experienced bullying (Ditch the Label). 83% of young people say that bullying has a negative impact on their self-esteem (Ditch the Label). 3 in 5 young people say that homophobic bullying has a direct impact on their school work and it made straight A students want to leave education entirely (Stonewall).